I started building a small workshop at home to satisfy all my "electronic engineering" needs. But no workshop is functional without a table or a workbench. So I needed one... and it was either buying or building one. I went for the latter. My friend Wellington Lizardo was kind enough to help me build it. It took us a few days to get the job done, and it was our very first time doing such thing. Here's how it looked in the end! It is made of treated pinewood. The dimensions for the table are 5'x2'. We used 1" and .5" phillips flat head wood screws to secure all the wood pieces together. 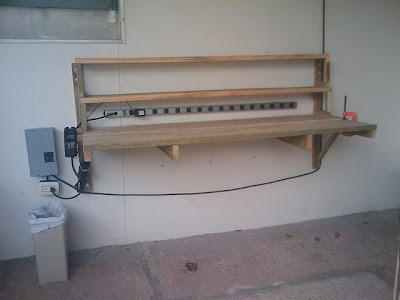 To secure the workbench to the wall, we used six 2" hex bolts. Since the wall is made of old concrete, we had to drill a lot. Yes, a lot. I got a separate breaker box, fed directly from the power lines. This picture was taken before I had installed a Voltmeter Panel on the breaker box. You can also see the Tripp Lite PS4816 16-Outlet Power Strip. That baby can provide a total max current of 15 Amps. Also, hooked on the table is the charger for the Denali 3.6-Volt Lithium-Ion Cordless Screwdriver, which I believe is very convenient.